Alf Iggulden was a prominent sportsman especially good at boxing and rugby. Alfred William Iggulden was born in Masterton in 1890, youngest child of William and Georgina. Along with sister Edith, he began education at Masterton Central School in 1897. The Igguldens were a rugby family, with father William and brother Monte playing for the Red Star Club, and Alf in Egypt for the Wellington Mounted Rifles team. William was a carrier in Masterton and as war broke out, Alf worked for his father, still living at home in 67 Villa Street. 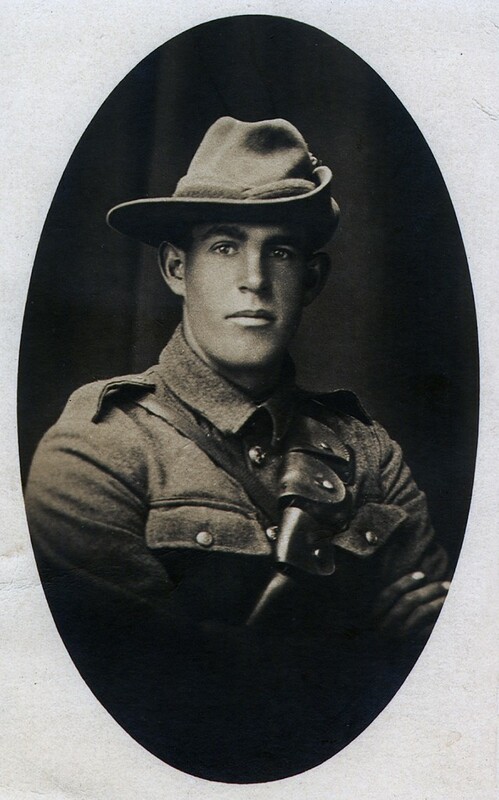 His job involved handling horses so it was natural for Alf to enlist in the Wellington Mounted Rifles on 11 August 1914, with the service number of 11/296. For his time, Alf was a big man, 5 ft 11 inches (1.8m) and almost 12 stone (80kg). A photo of the Wellington Mounted Rifles rugby team notes he was also runner-up for the NZEF Boxing Championship, beaten by Henry ‘Tas’ Smith, also of Masterton. Part of the mounted rifles group which marched to Masterton Railway Station on 13 August 1914, Alf went into camp at Awapuni Racecourse and departed in October with the Main Body. Training continued in Egypt, though, in a letter to Monte in April 1915, Alf noted that the horses could only be worked a few hours each day as temperatures climbed. He also rather coyly hinted at exotic sights in Cairo, writing ‘…I think that sort of thing is best left alone in letters, wrong conclusions are sometimes drawn and then trouble commences’. Alf travelled to Gallipoli with the horseless Mounted Rifles in May 1915. He survived the fight at No.3 Post on 30 May, but his involvement in the August Offensive is not known. After the August Offensive, Hill 60 was the junction of the British force at Suvla Bay and the Anzac perimeter. It was decided to consolidate this junction with an attack against the Turkish-held position on the hill. On 21 August a mixed force of New Zealand, Australian, Gurkha and British soldiers attacked the low, scrubby hill with some success but heavy casualties. A few days later another attack sought to improve the position. This involved the depleted NZ Mounted Rifles, about 300 in all. Alf took part in this attack on 27 August which gained some Turkish trenches but did not capture Hill 60. He was killed, along with 150 New Zealanders, in the two days of fighting. It was the last attack at Gallipoli by New Zealanders before the evacuation in December 1915. Alf Iggulden has no known grave and is commemorated on the Hill 60 (New Zealand) Memorial, north of Anzac Cove.